After dealing with osteosarcoma for five years, Matt Siegle founded Fishin' for the Cure. His dream was to cure pediatric cancers, and the organization has raised nearly $40,000 for osteosarcoma research. 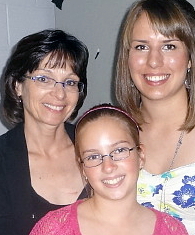 Annina is a young survivor who has designed beautiful cards to benefit osteosarcoma research. These photos come from around the world. Learn more. Osteosarcoma is one of more than 50 kinds of sarcoma. Each kind is rare, yet all together sarcomas affect hundreds of thousands of people around the world. Osteosarcoma is a type of cancer that produces immature bone. It is the most common type of cancer that arises in bones, and it is usually found at the end of long bones, often around the knee. Most people diagnosed with osteosarcoma are under the age of 25, and it is thought to occur more often in males than females. Osteosarcomas range from low grade tumors that only require surgery to high grade tumors that require an aggressive treatment regimen. Patients with osteosarcoma are best treated at a cancer center where an expert sarcoma team and resources are available to provide specialized and responsive care. Scientists have not discovered the cause of most cases of osteosarcoma. Osteosarcoma can develop as a result of radiation to an area of the body. It can also be associated with specific genetic changes and diseases. Most people with osteosarcoma do not feel sick. Patients may have a history of pain in the affected area and may have developed a limp. Often the pain is thought to be related to muscle soreness or "growing pains," but it does not go away with rest. Many patients only see a doctor when there is some sort of injury to the area or when the tumor weakens a bone so much that it breaks (this is called a pathological fracture). An MRI of the entire bone where the primary tumor is located. This test can rule out "skip metastases" (spread of the tumor to other areas of the bone). A biopsy of the tumor, which provides a definite diagnosis based on the characteristics of tumor tissue seen under a microscope. The biopsy will also show whether the tumor is high grade (highly malignant, which is the case for most osteosarcomas) or low grade. There are two main types of biopsy: a needle aspiration and a surgical biopsy. The location, incision and technical aspects of the biopsy can affect a patient’s treatment options and outcome. Therefore, it is essential that the biopsy is planned by a surgeon experienced with sarcomas. The results of the biopsy and imaging studies provide physicians with an idea of the "personality," or stage, of the disease. Most patients are diagnosed with high grade disease that does not appear to have spread throughout the body. However, it is believed that about 80% of patients with high grade osteosarcoma already have metastatic disease that is not yet visible on imaging tests. Osteosarcoma is often treated with a combination of therapies that can include surgery, chemotherapy and radiation therapy. Most patients with high grade tumors receive about three months of chemotherapy, known as neo-adjuvant therapy, before surgery. A surgeon will then remove the tumor, along with a wide margin of healthy tissue around the tumor, with the goal of leaving the area free of all disease. Most tumors at the bones and joints can be removed safely while sparing the involved limb. A surgeon might use a metal implant, an allograft (bone taken from a cadaver), a combination of an implant and allograft, or a bone taken from the patient in order to replace tissues that are removed during surgery. Occasionally, because of a tumor’s size or location, an amputation or rotationplasty is the best way to completely remove the cancer and restore the patient to a functional life. When considering surgical options, it is important that the patient and surgeon talk about the expected functional results of each option and the possible complications and risks involved. It may be in the patient’s best interest to ask a surgeon how many procedures he or she has done that involve a specific joint and to seek a second opinion from a surgeon who has more experience performing a specific surgery. Overall, patients who have limb salvage surgery and those who have amputation report similar rates of satisfaction and function after their recovery, but these rates vary greatly from one person to the next. After surgery, a pathologist will report the tumor’s necrosis rate (the percentage of tumor cells that are dead), which is an indicator of how well the tumor is responding to the chemotherapy. Based on the necrosis rate, drugs are chosen for additional chemotherapy treatment, which normally lasts about six months after surgery. Though radiation therapy is not widely used in osteosarcoma treatment, it can be effective and is occasionally recommended, especially when a tumor is difficult to remove surgically or when residual tumor cells remain after surgery. Tests are done to monitor each patient’s health during treatment, with a focus on the heart, kidneys and liver. Some patients are also given scans that can indicate a tumor’s response to therapy. Because each individual responds differently, there may be significant changes to a patient’s treatment plan along the way. What is the prognosis for osteosarcoma patients? Prognosis statistics are based on the study of groups of osteosarcoma patients. These statistics cannot predict the future of an individual patient, but they can be useful in considering the most appropriate treatment and follow-up for a patient. When treated appropriately, patients with high grade osteosarcoma in one location have a survival rate of about 70%. The survival rate is higher for patients with low grade tumors, and it is lower for those whose disease has spread throughout the body and for those whose tumors have a poor response to chemotherapy. How are patients followed after treatment? The National Comprehensive Cancer Network recommends a schedule of follow-up exams and tests for osteosarcoma patients. It includes appointments every three months for the first two years, every four months for the third year, every six months for the fourth and fifth year, and annually thereafter. Most appointments include a physical exam, imagining of the original tumor’s location and imaging of the lungs. In patients who have been treated with chemotherapy, tests are also done periodically to monitor the heart, liver and kidneys; to test for hearing loss and to check hormone levels, bone density and cholesterol. If recurrence is detected at follow-up, further chemotherapy and/or surgery is usually recommended. Osteosarcoma is the name given to a heterogeneous group of malignant spindle cell tumors that have as their common feature the production of immature bone, also known as osteoid. The degree of malignancy, and thus the tendency to metastasize (or spread), is determined by the histologic grade (how the tumor appears under the microscope). Sarcomas in this family range from those in which a cure can be achieved with surgery alone to those that are highly lethal, even with the most aggressive therapeutic interventions. While cure rates may approach 65-70% with multimodal therapy in patients with focal disease, the course of therapy may prove long and arduous, often lasting a year or more. As survival rates continue to improve, new challenges regarding the long-term care of osteosarcoma patients on several fronts continue to arise. Therefore, care of individuals with osteosarcoma is usually best undertaken in a multidisciplinary cancer center where the resources and personnel requisite to the care of these complex patients are most readily available. The following discussion will focus on classic high-grade osteosarcoma with references made to various subtypes as appropriate. It is also important to note that this discussion is in no way intended to be exhaustive, rather it is a review of current thought to aid communication between patient and physician. In their article Osteosarcoma on the eMedicine website, Drs. Mehlman and Cripe state, "Osteosarcoma is an ancient disease that is still incompletely understood. The term sarcoma was introduced by the English surgeon John Abernathy in 1804 and was derived from Greek roots meaning fleshy excrescence (Peltier, 1993). In 1805, the French surgeon Alexis Boyer (personal surgeon to Napoleon) first used the term osteosarcoma (Rutkow, 1993; Peltier, 1993). Boyer realized that osteosarcoma was a distinct entity from other bone lesions such as osteochondromas (exostoses)." Peltier L. F., "Tumors of bone and soft tissues" in Orthopedics: A History and Iconography. San Francisco, California, Norman Publishing; 1993: 264-291. Rutkow I. M., "The nineteenth century" in Surgery: An Illustrated History. St. Louis: Mosby; 1993: 321-504. Osteosarcoma is the most common primary solid tumor of bone, comprising about 20% of primary bone sarcomas (Dahlin 1986). About 400-1000 new cases are diagnosed per year in the United States (Marina 2004, Gibbs 2001), giving osteosarcoma an incidence of about 3/1,000,000 population. It is largely a disease of youth, with more than 75% of cases occurring in those less than 25 years of age (Mirra 1989). Those occurring in adults are more likely to be secondary sarcomas, particularly those arising in Paget’s Disease of Bone, bone infarcts, chronic osteomyelitis and in previously irradiated tissues (Mirra 1989). Osteosarcomas are generally felt to be slightly more common in males, perhaps due to a longer period of skeletal growth as compared to females (Dorfman 1998). An exception to this tendency is parosteal osteosarcoma, which is more common in women and occurs in a slightly older age group (Dahlin 1986). No ethnic or racial predilection has been noted (Buckley 1998, Dorfman 1998, Weis 1998). What causes osteosarcoma? Though some understanding has been achieved, the answer to this question remains largely a mystery in most cases. Fuchs and Pritchard (2002) break down "known" causative agents into chemicals, viruses, radiation and miscellaneous. Chemical factors, thought to act by leading to genetic alterations, include beryllium compounds and methylcholanthrene. Rous et al (1912) were the first to report evidence of a viral etiology of sarcoma. The Rous sarcoma virus (a retrovirus or RNA virus) contains a gene called V-Src, which has a naturally occurring homologue thought to be a proto-oncogene (Pritchard 1975). While other viruses have been associated with bone tumor induction (Diamondopoulas 1973, Stewart 1960), FBJ is the only viral agent isolated from a naturally occurring sarcoma (Fuchs 2002) and is known to be a potent inducer of osteosarcoma in mice (Finkel 1966). The oncogene in FBJ is related to a naturally occurring protooncogene called c-Fos (Fuchs 2002), which has been found to be associated with a poor response to chemotherapy in patients with osteosarcoma (Kakar 2000). An introduction to DNA, RNA and proteins can be found on the Nobel website. After clicking on the above hyperlink, make sure to read the section "Learn how to navigate in the document" to take full advantage of this tutorial. Radiation is thought to play a critical role in the formation of many cancers. Its role in osteosarcoma is probably best delineated by its association with formation of secondary sarcomas occurring years after radiation treatment for other cancers, of which osteosarcoma is a common histologic finding (Enzinger 1995, Tucker 1990, 1987, 1985, Huvos 1985, Weatherby 1981). Other miscellaneous causes have been suggested. The association of osteosarcoma and Paget’s disease of bone is well-known, and is believed to occur in about 1% of affected Paget’s disease patients. A genetic loss of heterozygosity affecting chromosome 18 has been proposed (Hansen 1999, McNairn 2001), but the exact mechanism remains elusive. One of the better characterized genetic alterations associated with osteosarcoma is loss of heterozygosity of the retinoblastoma (RB) gene. The product of this gene is a protein that acts to suppress growth of cells with damaged DNA (tumor suppressor). Loss of function of this gene allows cells to grow unregulated, leading to formation of certain cancers, including osteosarcoma. Presence of this mutation has been associated with decreased survival rates in patients with osteosarcoma (Feugeas 1996). TGF-β is a growth factor found in higher levels in high-grade osteosarcoma than in low grade lesions (Franchi 1998) and is a known inhibitor of the RB gene product, perhaps contributing to the aggressive behavior of these tumors. Mutations of the p53 gene, another tumor suppressor, are also associated with osteosarcoma, and some combined inactivation of Rb and p53 is found in most osteosarcomas (Ladanyi 2003). Human epidermal growth factor receptor (HER-2 or ERB-2) is another molecular alteration associated with osteosarcoma. Its over expression is associated with a more clinically aggressive tumor, increased metastatic potential, shorter recurrence-free intervals and worse overall survival rates (Ferrari 2004, Morris 2001, Gorlick 1999, Onda 1996). Similar associations have been reported for P-glycoprotein, an important mediator of multi-drug resistance in tumor cells (Ferrari 2004, Pakos 2003, Park 2001, Hornicek 2000) and VEGF, a growth factor responsible for tumor angioneogenesis (Hoang 2004, Kaya 2002, Zhao 2001, Kaya 2000). While many cytogenetic variations exist in osteosarcomas, the presence of predictable diagnostic patterns is conspicuously absent (Sandberg 1994). The most common complaints that lead patients with osteosarcoma to seek medical attention are pain and presence of a palpable mass (see Figure 1), noted in up to 1/3 of patients at the first visit (Widhe 2000). In smaller children, a limp may be the only symptom. The pain may be present for many months, and initially be confused with more common sources such as muscle soreness, overuse injury or "growing pains." Often it is not until trauma has occurred to the afflicted extremity that radiographs are obtained and an abnormality of the bone is detected. Unfortunately, if fracture through the weakened bone occurs (pathologic fracture), this can increase the rate of local recurrence of the tumor after surgery and decrease the patient’s overall chance of survival (Scully 2002). A high index of suspicion accompanied by careful examination of the limb and appropriate radiographs at initial assessment may reduce the incidence of such delays in diagnosis and the associated risks. Pain that fails to resolve with conventional measures or is present at rest or wakes the patient from sleep should alert the clinician that further evaluation is needed. Once the presence of a tumor is suspected, referral to a musculoskeletal oncologist is warranted. As with most sarcomas, patients often do not look or feel "sick." Presence of fever, malaise or other constitutional symptoms is not typical of osteosarcoma. Laboratory studies may be helpful, but are not specific for osteosarcoma. Sedimentation rate, C—reactive protein, alkaline phosphatase (ALP) and lactate dehydrogenase (LDH) levels may be elevated. Pretreatment elevation of ALP, present in some 50% of patients, has been suggested to be associated with an increased risk of relapse (Bacci 1993). LDH, when elevated, confers a worse prognosis, presumably by indicating a more biologically aggressive tumor (Bacci 1994, Meyers 1992). In most variants of osteosarcoma, the plain radiographs may be virtually diagnostic. Classically, these lesions are located in the metaphyses (the ends) of long bones, most commonly about the knee (see Figure 2). Lesions are poorly marginated, associated with destruction of the cancellous and cortical elements of the bone, and show ossification within the soft tissue component (Gebhardt 2002, Gibbs 2001). Lesions may appear radiolucent, radiodense or mixed lucent and dense, depending on the degree of osteoid mineralization (Kesselring 1982). Surface variants are different in that they appear to rest atop the bone. Destructive involvement of the medullary canal in surface lesions is typically absent, though may be evident in advanced disease. Telangiectatic osteosarcomas often are completely radiolucent. These may be confused with benign lytic tumors such as aneurysmal bone cysts. If any question exists, a biopsy should be performed. 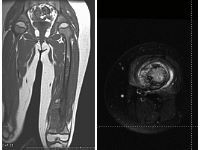 Other imaging modalities have a role in the initial evaluation of suspected osteosarcoma, particularly magnetic resonance imaging (MRI). MRI has replaced computed tomography (CT) as the test of choice for elucidating the extent of local disease. While CT better details the extent of bony destruction, MRI has the advantage of providing multi-axial images, more detail regarding the soft tissue component and its relationship to nearby neurovascular structures, and is more sensitive in quantifying the extent of intramedullary involvement, see figure 3 (Estrada 1995, Gillespy 1988, Sundaram 1987). T1-weighted coronal and sagittal MRI images are utilized to demonstrate the extent of intramedullary disease, while T2-weighted axial images better visualize the soft tissue component (Gillespy 1988). In addition, contrasted MRI allows exquisite visualization of the tumor in relation to the nascent anatomy (i.e. nerves, blood vessels, and muscles), making it invaluable for staging and surgical planning. Since MRI does not expose the patient to ionizing radiation, it also provides a safe and accurate way to follow response to treatment and screen for recurrence with serial studies (although the metal prosthetic reconstructions or bone plates may affect the detail of the MRI image). Bone scans (nuclear scintigraphy) and FDG-PET are useful adjuncts, but are more pertinent to staging than for evaluation of the primary lesion. The most valuable use of bone scan for evaluation of osteosarcoma is the detection of metastatic deposits within the skeleton. A useful introduction the human skeletal system can be found on the Medical Terminology and Cancer" website of Simon Cotterill (of the University of Newcastle upon Tyne). It is entitled "The Skeletal System." How aggressive is the tumor (grade)? Grade refers to how biologically aggressive the tumor appears. This is based on histological features noted at the time of biopsy. Most osteosarcomas are considered high grade (highly malignant). Extent refers to whether or not the tumor has grown beyond its compartment of origin (in the case of osteosarcoma, whether it has eroded through the bone into the surrounding soft tissue). Spread of any tumor to another site in the body is referred to as metastasis. Metastatic disease generally confers a worse prognosis to the patient than those patients without detectable metastases at diagnosis. It is generally accepted that about 80% of patients with high grade osteosarcoma have micrometastatic disease at the time of diagnosis, although there are no blood tests available to test for this microscopic disease (Link 1986). In the case of staging, however, metastasis really refers to that which can be detected by imaging (less than 20% of patients with osteosarcoma, see Ferguson 2001). The two most common sites of spread of osteosarcoma are lung and bone. Therefore, critical to the staging process are chest X-ray, CT scan of the chest and bone scan. MRI of the entire involved bone is necessary not only to evaluate the extent of the primary lesion, but also to look for "skip" metastases (Van Trommel 1997), which may be missed on bone scan (Bhagia 1997). These are metastatic foci of tumor within (or distant from) the bone of origin, and occur in less than 5% of osteosarcomas (Campanacci 1999). When detected, these lesions confer a poor prognosis, despite continued advances in adjuvant therapy (Wuisman 1990, Sajadi 2004). Once all of the initial imaging and laboratory exams have been obtained, a biopsy is performed. The biopsy is critical, as it is the means by which tissue is acquired in order to make a definitive diagnosis. The histology (or the way it looks under the microscope) of the tumor gives the first clues to its behavior. The requisite tissue can be obtained via needle biopsy or through open methods. Open techniques constitute surgery and are performed in the operating room. These provide the most tissue for review by the pathologist, but often are not necessary, since needle biopsy of the soft tissue mass usually can be performed. It is necessary to work with a musculoskeletal pathologist experienced in evaluating needle biopsy material in order for this technique to be practical. When needle biopsy is chosen, it is frequently performed by a radiologist under CT guidance. Placement of the needle should be under the direction of the surgeon who will perform the definitive resection as a poorly placed biopsy tract can greatly impair or even preclude successful limb-sparing surgery (Mankin 1996, 1982). Once pathological evaluation has been performed and a histologic grade assigned, all of the information is assimilated to determine the "personality" of the tumor. One of the more common and simple staging systems used in musculoskeletal oncology is that of Enneking et al (1986, 1980), see Table 1. Utilizing this system, most patients with osteosarcoma present with stage IIB disease. That is high-grade tumor with soft tissue extension and no detectable metastases. The histologic hallmark of osteosarcoma is the presence of frankly malignant osteoblastic spindle cells producing osteoid (Figure 4). Variations are common. Currently, the World Health Organization (WHO) recognizes three distinct subtypes of conventional osteosarcoma: osteoblastic, chondroblastic and fibroblastic (Raymond 2002). Mistaken diagnoses of chondrosarcoma or malignant fibrous histiocytoma may occur. The presence of woven bone with malignant appearing stromal cells, regardless of associated chondroid or fibrous matrix, makes the diagnosis of osteosarcoma. Osteoblastic osteosarcoma is microscopically composed of malignant appearing osteoblasts with woven bone as the predominant matrix. Chondroblastic osteosarcoma is composed of matrix that looks like cartilage with the malignant spindle cells found in the lacunae. The fibroblastic variant looks like a malignant spindle cell tumor, with scant osteoid being the only indicator of the presence of osteosarcoma. In reality, mixed appearances are common. While knowledge of these subtypes may aid the pathologist in considering the diagnosis when the histology is unclear, there is no data to support a difference in clinical behavior or prognosis based on these microscopic criteria (Marina 2004). Other clinically important subtypes exist. Parosteal osteosarcoma is a low grade surface variant. Microscopically, it is composed of a low grade fibrous stroma and less mitoses and cellular atypia when compared with conventional osteosarcoma (Okada 1994). A cartilage cap resembling that of an osteochondroma may be present (Wold 1990). Rarely a high grade sarcoma can arise in this setting (Sheth 1996, Wold 1984). Periosteal osteosarcoma is an intermediate grade surface lesion. It most often occurs in the diaphyses of long bones, and most commonly demonstrates chondroid histology. Telangiectatic osteosarcoma may radiographically and histologically resemble aneurysmal bone cyst. Cellular atypia and the presence of osteoid production, albeit commonly scant, herald the presence of this highly malignant entity (Wold 1990). The past thirty years have seen great progress in the treatment of osteosarcoma. Recognition of the importance of multimodal therapy in addition to advances in imaging is largely responsible. Not only have dramatic improvements in survival been achieved, but so has the ability to safely perform limb-sparing procedures in the majority of patients with osteosarcoma. The standard treatment of patients with conventional osteosarcoma consists of combination chemotherapy and surgery. Some controversy exists about the timing of chemotherapy and whether it is best started after (adjuvant) or before surgery. The latter is referred to as "neoadjuvant" chemotherapy. What is agreed upon is that either surgery or chemotherapy alone is insufficient for classic high-grade osteosarcoma. In the case of low grade surface variants, surgery alone may be curative. While chemotherapy may be indicated in intermediate grade lesions, it is not clearly a universal necessity and is probably best addressed on a case-by-case basis. Osteosarcoma should be considered a systemic disease. It is estimated that about 80% of patients have micrometastatic disease at the time of diagnosis, though in only 10-20% can this be initially detected by standard imaging modalities (Ferguson 2001). This is the basis for utilization of systemic chemotherapy. A definite benefit to chemotherapy when combined with surgery for osteosarcoma has been shown. The best survival results are achieved in patients who present with nonmetastatic disease. Once detectable spread has occurred, treatment becomes much more difficult, and results less predictable, yet with aggressive chemotherapy and surgery, long term survival in close to half of patients is still possible. In a randomized study, Link et al (1991) found a two year relapse free survival rate of 17% in patients treated with observation only after surgery, compared with 66% in patients who underwent chemotherapy. The survival gap between these two regimens increases with time (Link 1993). Historically, chemotherapy was given after surgery. With the emergence of limb-sparing procedures using custom metal prostheses (which often took weeks to manufacture), some centers began giving chemotherapy prior to surgery in an effort to start treatment as quickly as possible. This gave rise to consideration of neoadjuvant therapy with delayed surgery as a preferable method of treatment (Rosen 1979). This mode of therapy is predominant in most centers today. While neoadjuvant administration delays surgery by about 3 months, it has certain advantages. For instance, it allows for assessment of tumor necrosis (death of the cancer cells) at the time of resection. This gives valuable insight into the behavior of a particular tumor. In general, necrosis of > 90% is considered a good response to chemotherapy. It is less clear what to do if necrosis is < 90%, since changing chemotherapy regimens in poor responders has not been shown to improve overall outcome (Ferguson 2001). Another advantage of preoperative chemotherapy is that many tumors will "consolidate" or even shrink, making surgical resection safer and more feasible. Though generally considered helpful for the aforementioned reasons, preoperative chemotherapy has not been shown to improve overall event-free survival for patients with osteosarcoma (Goorin 2003) as was originally thought (Rosen 1979). Current protocols for osteosarcoma typically utilize drugs such as doxorubicin, high dose methotrexate (MTX) cis-platin and ifosfamide. Side effects such as cardiac toxicity or bone marrow suppression may require adjustment or even discontinuation of a given regimen. A pre-therapy workup including an echocardiogram and blood tests is routinely performed as a baseline to evaluate cardiac and renal function before beginning potentially toxic treatment. A thorough discussion regarding the drugs to be used, timing of their administration and potential and expected toxicities/side-effects should be undertaken with the medical oncologist prior to starting chemotherapy. Osteosarcoma is a surgical disease. Once discovered, the tumor must be removed if cure is to be achieved. Most commonly, this is done after a period of chemotherapy. The main goal of surgery is to safely and completely remove the tumor. Historically, most patients had an amputation. Over the past 30 years, limb-sparing procedures have become the standard, mainly due to concomitant advances in chemotherapy and sophisticated imaging techniques. Such advances have made limb salvage possible even after pathologic fracture, previously an absolute indication for amputation (Scully 2002). Limb salvage procedures now can provide rates of local control and long-term survival equal to amputation. The oncologic goal of tumor ablation must always take priority to function when choosing a procedure for a given patient. If the tumor can be removed safely while retaining a viable extremity, a limb sparing procedure may be appropriate. If major nerves or blood vessels are involved, or if complete tumor removal results in significant loss of function, amputation may be a better choice. Other factors such as the patient’s age, desired level of function, cosmetic preference and long-term prognosis must also be considered. Ongoing, detailed dialogue between the patient, the patient’s family and the healthcare team is a necessity when deciding which surgical route to pursue. Surgery requires much preoperative planning and evaluation. The patient is staged (as described above) again prior to surgery to determine what changes have occurred in response to systemic therapy. Usually plain radiographs and an MRI of the primary lesion are obtained in addition to a whole body bone scan and chest CT scan. These new studies often give the best information for surgical planning, and also help detect the presence of any new lesions and/or evaluate existing metastases. A final decision regarding the recommended surgery should be reached as early as is feasible, particularly if limb salvage is to be performed, since reconstructive techniques may take weeks to plan. Surgical procedures fall into three basic categories: amputation, limb salvage and rotationplasty. Amputation involves removal of the limb with a safe margin between the end of the retained portion and the tumor (see "wide" or "radical" resection in Table 2). Functional outcomes after amputation vary and are dependent on many factors. For upper extremity amputations, results tend to be better in younger patients with an intact elbow joint. Lower extremity amputations are more complicated. One study found that patients’ perception of outcome of lower limb amputations were strongly correlated with the comfort of the residual limb, the condition of the opposite limb, fit and function of the prosthetic device, perceptions of how others viewed the patients in lieu of their amputations and ability to participate in exercise (Matsen 2000). While differences between amputation and limb-sparing procedures do exist, long term outcomes with regards to patient function and satisfaction appear to be similar (DiCaprio 2003, Refaat 2002, Nagarajan 2002). While cheaper initially, amputation may be more expensive long term than endoprosthetic limb salvage because of the cost of the prosthesis and the need for periodic replacement of the prosthesis (Grimer 1997). 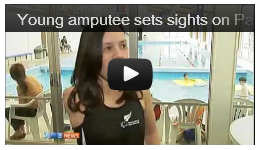 Perhaps the biggest advantage of amputation is that it is a single operation associated with few overall complications. Amputees also have more latitude in pursuing sports because they don’t have to worry about complications related to a limb salvage prosthesis or allograft such as loosening or fracture. Limb salvage involves removing the tumor with a normal cuff of tissue surrounding it while preserving vascular and nerve supply to the extremity (see "wide resection" in Table 2). Once the tumor is removed, the skeletal defect must be reconstructed. Some defects can be extensive, averaging 15-20 cm in size and requiring complex reconstructions (DiCaprio 2003). Options include use of metallic prostheses, allograft (cadaveric) bone, vascularized bone acquired from the patient, or replacement of the resected bone after sterilization in an autoclave. The choice of reconstruction must take into account the location and size of the defect, expected functional outcome and wishes of the patient and his/her family. Today, endoprosthetic, allograft or allograft-prosthetic composite reconstructions are most commonly performed. Endoprosthetic reconstruction has gained wide popularity for limb-sparing surgery. This involves replacing the removed bone with a metal implant (see Figure 5). This obviates the need for bone to bone healing as is necessary with allografts. Earlier, more aggressive rehabilitation can usually be undertaken. Complications with this type of reconstruction include component loosening and wound problems. Aseptic loosening is most likely in patients younger than 20 years with long distal femur replacement (Unwin 1996). Overall survival of these implants is reported to be 80% at 5 years, 65% at 10 years and 50% at 20 years (Damron 1997, Unwin 1996, Malawer 1995). Infection rates in these series ranged up to 13%. Even if catastrophic complications are avoided, the potential need for multiple revision/lengthening procedures can be burdensome. A recent report of 25 patients with endoprosthetic reconstruction revealed that 10 (40%) required at least one revision operation and that the median time to first revision was 4.9 years (Tunn 2004). Ruggieri et al (1993) reported a 63% complication rate with limb salvage procedures compared to 0% for amputation and 44% for rotationplasty. It is important for clinician and patient to understand the inherent risks and long-term reality of their choices. Cadaveric allografts offer the benefit of biologic incorporation into the host bone. The limiting factor is time to incorporation. Chemotherapy has been shown to impair union of allograft to host bone (Hazan 2001). A comprehensive review of more than 800 allograft reconstructions revealed that if the allograft survived beyond 3 years, it was associated with excellent long-term graft survival (Mankin 1996). The greatest barriers to overcome in the first 3 years were infection (11% incidence), fracture (19%) and nonunion (17%). Osteoarticular allografts (those that replace a joint surface) bear the additional risk of joint deterioration. In the previously mentioned series, 16% of patients with osteoarticular allografts about the knee and 20% of those about the hip required total joint replacement at an average of 5 years after implantation. Additional concerns with the use of bulk allografts are disease transmission and immunogenic responses to the foreign material. While "rejection" as with other transplanted organs does not occur, immune reaction may impair graft healing and delay incorporation. Size constraints also may prove limiting, particularly in younger or smaller patients, since donors typically are of adult size. Rotationplasty is a compromise between amputation and limb salvage most commonly used for osteosarcomas of the distal femur. It is essentially an intercalary amputation where the neurovascular structures and distal aspect of the limb (leg) are retained, and re-attached to the proximal portion (proximal femur and hip) after the tumor has been removed. For functional purposes, the distal segment is turned 180 degrees so that the ankle joint functions as a knee joint, thus converting an above-knee to a below-knee amputation in order for prosthetic use to be maximized (see Figure 6). Excellent functional results with regards to "knee" flexion, prosthetic ambulation and even sports participation can be routinely achieved (Merkel 1991). This is partly due to the retention of proprioception and sensation of the foot (Winkelmann 1996). Rotationplasty is best suited for skeletally immature patients (less than 12 years old) with tumors about the knee, though it has been successfully performed in older patients. The main disadvantage to this form of reconstruction is the cosmetic appearance. Preoperative education and counseling about the nature of the operation, course of postoperative physical therapy and the appearance of the limb after rotationplasty are essential. It is often helpful if the patient and his/her family are able to meet someone who has undergone rotationplasty in order to gain a better, more realistic level of understanding of how to live with a rotated limb. Special consideration must be given to skeletally immature patients, as continued growth of the uninvolved extremity may pose additional problems and require multiple future operations. This is most exaggerated for tumors occurring about the knee, as these growth plates provide 70% of the overall limb length (Finn 1991). Contralateral growth plate arrest or ipsilateral limb lengthening may be required to equalize limb length differences. 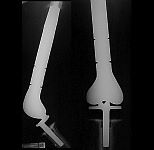 Modular and expandable endoprostheses are being used more commonly to achieve limb length equality. These implants utilize smooth uncemented stems for fixation across the retained growth plate so that some growth can continue to occur (Neel 2004, Eckardt 1993). Attainment of skeletal maturity often necessitates revision to a more "permanent" prosthesis with all of the associated risks discussed previously. Attendant risks are similar to those for other limb-sparing procedures, with loosening and infection being the most common complications. Despite the potential need for multiple procedures, functional results and overall patient satisfaction appear to be acceptable (Neel 2003, Plötz 2002, Eckardt 2000, Tillman 1997, Ward 1996, Eckardt 1993, Kenan 1991). Drs. Marulanda and Letson have written an ESUN editorial about the importance of identifying prognostic factors in osteosarcoma. With current treatment regimens, patients with osteosarcoma without detectable metastases have survival rates that approach 70%. Factors that seem to negatively impact prognosis are site (axial locations fare worse), larger tumor size, poor response to chemotherapy and presence of metastatic disease (Bielack 2002). The most consistent and clinically relevant of these is presence of detectable metastases (Bielack 2002, Marina 1993, Meyers 1993). Patients presenting with resectable pulmonary lesions have about a 30-50% chance of survival (Bacci 1997). Those with unresectable pulmonary metastases, lesions unresponsive to chemotherapy or multiple bone lesions continue to fare much worse, regardless of treatment (Ferguson 2001, Bacci 1996, Meyers 1993). Once treatment has been completed, careful follow up is required to monitor for signs of recurrence, metastasis and treatment related complications. This involves careful physical examination, radiographs of the primary site, serial chest imaging, bone scans and laboratory examinations. Such evaluation is performed frequently in the immediate post-treatment period and less frequently with time as long as the patient remains free of disease. If recurrence is detected, additional surgery and chemotherapy may be warranted. The same principles apply as for primary disease, though long-term survival rates are lower (Ferguson 2001, Link 1991). Some data suggest that patients with early relapse (< 1 year after treatment) have poorer outcomes than those who relapse later (Ferrari 1997). Over the last 30 years, osteosarcoma has gone from a disease that proved uniformly fatal to one that is potentially curable. Improvements in long-term survival brought about by advances in systemic therapy have led to many new challenges in caring for these patients. As patients live longer with the diagnosis of osteosarcoma, function and quality of life measures are becoming increasingly more important. Decisions regarding treatment now must consider consequences that may occur much later in the patient’s life. Further understanding of the etiology and pathogenetic mechanisms at work in osteosarcoma hopefully will lead to new, innovative treatment options. Continued collaborative research on the clinical and laboratory fronts is necessary for such future advances to be achieved. Bacci G, Ferrari S, Sangiorgi L et al. Prognostic significance of serum lactate dehydrogenase in patients with osteosarcoma of the extremities. J Chemother 1994; 6(3): 204-10. Bacci G, Mercuri M, Briccoli A et al. 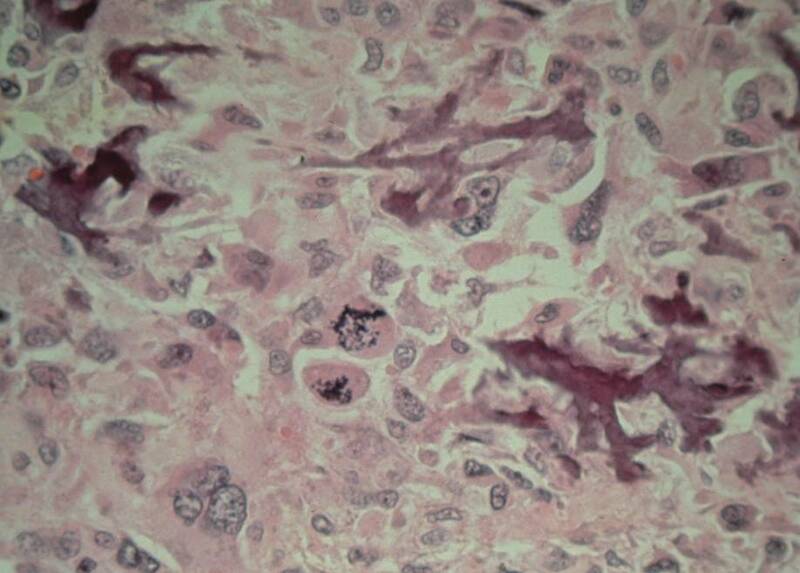 Osteogenic sarcoma of the extremity with detectable lung metastases at presentation. Results of treatment of 23 patients with chemotherapy followed by simultaneous resection of primary and metastatic lesions. Cancer 1997; 79: 245-254. Bacci G, Picci P, Ferrari S et al. Prognostic significance of serum alkaline phosphatase measurements in patients with osteosarcoma treated with adjuvant or neoadjuvant chemotherapy. Cancer 1993; 71(4): 1224-30. Bacci G, Picci P, Ferrari S et al. Synchronous multifocal osteosarcoma: Results in twelve patients treated with neoadjuvant chemotherapy and simultaneous resection of all involved bones. Ann Oncol 1996; 7: 864-866. Bhagia SM, Grimer RJ, Davis Am et al. Scintigraphically negative skip metastasis in osteosarcoma. Eur Radiol 1997; 7: 1446-1448. Bielack SS, Kempf-Bielack B, Delling G et al. Prognostic factors in high-grade osteosarcoma of the extremities or trunk: an analysis of 1,702 patients treated on neoadjuvant cooperative osteosarcoma study group protocols. J Clin Oncol 2002; 20: 776-790. Buckley JD, Pendergrass TW, Buckley CM et al. Epidemiology of osteosarcoma and Ewing’s sarcoma in childhood: a study of 305 cases by the Children’s Cancer Group. Cancer 1998; 83: 1440-1448. Campanacci M. "High Grade Osteosarcomas." In Bone and Soft Tissue Tumors: Clinical Features, Imaging, Pathology and Treatment. New York: Springer-Verlag; 1999, pp. 463-515. Dahlin DC, Unni KK. "Osteosarcoma." In Bone Tumors: General Aspects and Data on 8, 542 Cases, 4th edition. Springfield: Charles C. Thomas; 1986. Damron TA. Endoprosthetic replacement following limb-sparing resection for bone sarcoma. Semin Surg Oncol 1997; 13: 3-10. Diamandopoulas GT. Induction of lymphocytic leukemia, lymphosarcoma, reticulum cell sarcoma and osteogenic sarcoma in the Syrian golden hamster by oncogenic DNA simian virus 40. J Natl Cancer Inst 1973; 50: 1347-1365. DiCaprio MR, Friedlander GE. Malignant bone tumors: Limb sparing versus amputation. J Am Acad Orthop Surg 2003; 11(1): 25-37. Dorfman HD, Czerniak B. "Osteosarcoma." In Bone Tumors. St. Louis: Mosby; 1998, pp 128-252. Eckardt JJ, Kabo JM, Kelley CM et al. Expandable endoprostheses reconstruction in skeletally immature patients with tumors. Clin Orthop 2000; 373: 51-61. Eckardt JJ, Safran MR, Eilber FR et al. Expandable endoprosthetic reconstruction of the skeletally immature after malignant bone tumor resection. Clin Orthop 1993; 297: 188-202. Enneking WF. A system of staging musculoskeletal neoplasms. Clin Orthop 1986; 204: 9-24. Enneking WF, Spanier SS, Goodman MA. A system for the surgical staging of musculoskeletal sarcoma. Clin Orthop 1980; 153: 106-120. Enzinger FM and Weiss SW eds. "General considerations." In Soft Tissue Tumors, Third Edition. St. Louis, 1995, Mosby, pp 1-16. Estrada J. "Osteosarcoma." In Imaging of Bone Tumors: A Multidisciplinary Approach, Greenfield GB, Arrington JA, Eds. Philadelphia: Lippincott; 1995, pp 446-450. Ferguson WS, Goorin AM. Current treatment of osteosarcoma. Cancer Invest 2001; 19(3): 292-315. Ferguson WS, Harris MB, Goorin AM et al. Presurgical window of carboplatin and surgery and multidrug chemotherapy for the treatment of newly diagnosed metastatic or unresectable osteosarcoma: Pediatric Oncology Group trial. J Pediatr Hematol Oncol 2001; 23 (6): 340-348. Ferrari S, Bacci G, Picci P et al. Long-term follow-up and post-relapse survival in patients with non-metastatic osteosarcoma of the extremity treated with neoadjuvant chemotherapy. Ann Oncol 1997; 8: 765-771. Ferrari S, Bertoni F, Zanella L et al. Evaluation of P-glycoprotein, HER-2/ErbB-2, p53, and Bcl-2 in primary tumor and metachronous lung metastases in patients with high-grade osteosarcoma. Cancer 2004; 100(9): 1936-42. Feugeas O, Guriec N, Babin-Boilletot A et al. Loss of heterozygosity of the Rb gene is a poor prognostic factor in patients with osteosarcoma. J Clin Oncol 1996; 14: 467-472. Finkel MP, Biskis BO, Sribner GM. Virus induction of osteosarcomas in mice. Science 1966; 151: 698-701. Finn HA, Simon MA. Limb-salvage surgery in the treatment of osteosarcoma in skeletally immature individuals. Clin Orthop 1991; 262: 108-118. Franchi A, Arganini L, Baroni G et al. Expression of transforming growth factor beta isoforms in osteosarcoma variants: association of TGF beta 1 with high grade osteosarcomas. J Pathol 1998; 185: 284-289. Fuchs B and Pritchard DJ. Etiology of osteosarcoma. Clin Orthop 2002; 397: 40-52. 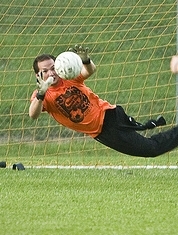 Gebhardt MC, Hornicek FJ. "Osteosarcoma." In Orthopaedic Knowledge Update: Musculoskeletal Tumors. Rosemont: American Academy of Orthopaedic Surgeons; 2002, pp 175-186. Gibbs, Jr. CP, Weber K, Scarborough MT. Malignant bone tumors. J Bone Jt Surg 2001; 83-A (11): 1728-1745. Gillespy T III, Manfrini M, Ruggieri P et al. Staging of intraosseous extent of osteosarcoma: correlation of preoperative CT and MR imaging with pathologic macroslides. Radiology 1988; 167: 765-767. Goorin AM, Schwartzentruber DJ, Devidas M et al. Presurgical chemotherapy compared with immediate surgery and adjuvant chemotherapy for nonmetastatic osteosarcoma: Pediatric Oncology Group study POG-8651. J Clin Oncol 2003; 21: 1574-1580. Gorlick R, Huvos A, Heller G et al. Expression of HER2/erbB-2 correlates with survival in osteosarcoma. J Clin Oncol 1999; 17: 2781-2788. Grimer RJ, Carter SR, Pynsent PB. The cost-effectiveness of limb salvage for bone tumours. J Bone Jt Surg 1997; 79-B(4): 558-61. Hansen MF, Nelissery MJ, Bhatia P. Common mechanisms of osteosarcoma and Paget’s disease. J Bone Miner Res 1999; 14 (suppl 2): 39-44. Hazan EJ, Hornicek FJ, Tomford W et al. The effect of adjuvant chemotherapy on osteoarticular allografts. Clin Orthop 2001; 385: 176-181. Hornicek FJ, Gebhardt MC, Wolfe MW et al. P-glycoprotein levels predict poor outcome in patients with osteosarcoma. Clin Orthop 2000; (373): 11-7. Huvos AG, Woodard HQ, Cahan WG et al. Postradiation osteogenic sarcoma of bone and soft tissues: a clinicopathologic study of 66 patients. Cancer 1985; 55: 1244-1255. Kakar S, Mihalov M, Chachlani NA et al. Correlation of c-fos, p53, and PCNA expression with treatment outcome in osteosarcoma. J Surg Oncol 2000; 73: 125-126. Kaya M, Wada T, Akatsuka T et al. Vascular endothelial growth factor expression in untreated osteosarcoma is predictive of pulmonary metastasis and poor prognosis. Clin Cancer Res 2000; 6(2): 572-7. Kaya M, Wada T, Kawaguchi S et al. Increased pre-therapeutic serum vascular endothelial growth factor in patients with early clinical relapse of osteosarcoma. Br J Cancer 2002; 86(6): 864-9. Kesselring F, Penn W. Radiological aspects of "classic" primary osteosarcoma: value of some radiologic investigations. Diagn Imaging 1982; 51: 78-92. Ladanyi M, Gorlick R. Molecular pathology and molecular pharmacology of osteosarcoma. Pediatr Pathol Mol Med 2000; 19: 391-413. Link MP. The multi-institutional osteosarcoma study: an update. Cancer Treat Res 1993; 62: 261-267. Link MP, Goorin AM, Miser AW et al. The effect of adjuvant chemotherapy on relapse-fee survival in patients with osteosarcoma of the extremity. N Engl J Med 1986; 314: 1600. Malawer MM, Chou LB. Prosthetic survival and clinical results with use of large-segment replacements in the treatment of high-grade bone sarcomas. J Bone Jt Surg 1995; 77-A: 1154-1165. Mankin HJ, Lange TA, Spanier SS. The hazards of biopsy in patients with malignant primary bone and soft tissue tumors. J Bone Jt Surg 1982; 64-A: 1121-1127. Mankin HJ, Mankin CJ, Simon MA. The hazard of biopsy, revisited. J Bone Jt Surg 1996; 78-A: 656-663. Mankin HJ, Gebhardt MC, Jennings LC et al. Long-term results of allograft replacement in the management of bone tumors. Clin Orthop 1996; 324: 86-97. Marina NM, Pratt CB, Rao BN et al. Improved prognosis of children with osteosarcoma metastatic to the lung(s) at the time of diagnosis. Cancer 1992; 70: 2722-2727. Matsen SL, Malchow D, Matsen FA III. Correlations with patients’ perspectives of the result of lower-extremity amputation. J Bone Jt Surg 2000; 82-A (8): 1089-1095. McNairn JD, Damron TA, Landas SK et al. Inheritance of osteosarcoma and Paget’s disease of bone. A familial loss of heterozygosity study. J Mol Diagn 2001; 3: 171-177. Merkel KD, Gebhardt M, Springfield DS. Rotationplasty as a reconstructive operation after tumor resection. Clin Orthop 1991; 270: 231-236. Meyers PA, Heller G, Healey J et al. Chemotherapy for nonmetastatic osteogenic sarcoma: the Memorial Sloan-Kettering experience. J Clin Oncol 1992; 10(1): 5-15. Meyers PA, Heller G, Healey JH et al. Osteogenic sarcoma with clinically detectable metastasis at initial presentation. J Clin Oncol 1993; 11: 449-453. Morris CD, Gorlick R, Huvos G et al. Human epidermal growth factor receptor 2 as a prognostic indicator in osteogenic sarcoma. Clin Orthop 2001; 382: 59-65. Nagarajan R, Neglia JP, Clohisy DR, Robison LL. Limb salvage and amputation in survivors of pediatric lower extremity bone tumors: What are the long-term implications? J Clin Oncol 2002; 20(22): 4493-4501. Neel MD, Heck R, Britton L et al. Use of a smooth press-fit stem preserves physeal growth after tumor resection. Clin Orthop 2004; 426: 125-128. Neel MD, Wilkins RM, Rao BN, Kelley CM. Early multicenter experience with a noninvasive expandable prosthesis. Clin Orthop 2003; 415: 72-81. Okada K, Frassica FJ, Sim FH et al. 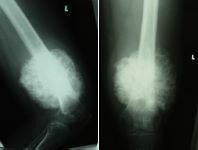 Parosteal osteosarcoma. A clinicopathological study. J Bone Jt Surg 1994; 76-A: 366-378. Onda M, Matsuda S, Higaki S et al. ERbB-2 expression is correlated with poor prognosis for patients with osteosarcoma. Cancer 1996; 77: 71-78. Pakos EE, Ioannidis JP. The association of P-glycoprotein with response to chemotherapy and clinical outcome in patients with osteosarcoma. A meta-analysis. Cancer 2003; 98(3): 581-9. Park YB, Kim HS, Oh JH et al. The co-expression of p53 protein and P-glycoprotein is correlated to a poor prognosis in osteosarcoma. Int Orthop 2001; 24(6): 307-10. Plötz W, Rechl H, Burgkart R et al. Limb salvage with tumor endoprostheses for malignant tumors of the knee. Clin Orthop 2002; 405: 207-215. Pritchard DJ, Finkel MP, Reilly CA. The etiology of osteosarcoma: a review of current considerations. Clin Orthop 1975; 111: 14-22. Raymond AK, Ayala AG, Knuutila S. Conventional osteosarcoma. In WHO Classification of Tumours: Pathology and Genetics of Tumours of Soft Tissue and Bone, Kleihues P, Sobin L, Fletcher C et al, eds. Lyon, France: IARC Press; 2002, pp. 264-270. Refaat Y, Gunnoe J, Hornicek FJ, Mankin HJ. Comparison of quality of life after amputation or limb salvage. Clin Orthop 2002; 397: 298-305. Rosen G, Marcove C, Caparros B et al. Primary osteogenic sarcoma: the rationale for preoperative chemotherapy and delayed surgery. Cancer 1979; 43: 2163-2177. Rous P, Murphy JB, Tytler WH. A filterable agent the cause of a second chicken-tumor, an osteochondrosarcoma. JAMA 1912; 59: 1773-1794. Ruggieri P, De Cristofaro R, Picci P et al. Complications and surgical indications in 144 cases of nonmetastatic osteosarcoma of the extremities treated with neoadjuvant chemotherapy. Clin Orthop 1993; 295: 226-38. Sajadi KR, Heck RK, Neel MD et al. The incidence and prognosis of osteosarcoma skip metastases. Clin Orthop 2004; 426: 92-96. Sandberg AA, Bridge JA. The Cytogenetics of Bone and Soft Tissue Tumors. Austin: RG Landes Company; 1994, pp 342-370. Scully SP, Ghert MA, Zurakowski D et al. Pathologic fracture in osteosarcoma: prognostic importance and treatment implications. J Bone Jt Surg 2002; 84-A (1): 49-57. Sheth DS, Yasko AW, Raymond AK et al. Conventional and dedifferentiated parosteal osteosarcoma. Diagnosis, treatment, and outcome. Cancer 1996; 78: 2136-2145. Stewart SE, Eddy BE, Irwin M et al. Development of resistance in mice to tumour induction by SE polyoma virus. Nature 1960; 186: 615-617. Sundaram M, McGuire MH, Herbold DR. 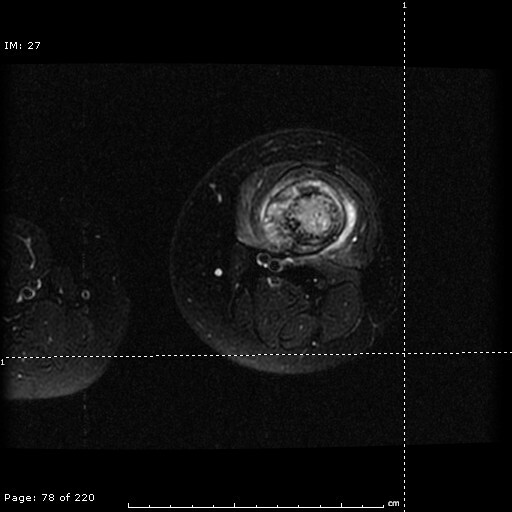 Magnetic resonance imaging of osteosarcoma. Skeletal Radiol 1987; 16: 23-29. Tillman RM, Grimer RJ, Carter SR et al. Growing endoprostheses for primary malignant bone tumors. Semin Surg Onc 1997; 13: 41-48. Tucker MA. Risk factors for the occurrence of leukemia and bone sarcomas as second malignant tumors. International Conference on Complications of Treatment of Children, 1990: 13. Tucker MA, D’Angio GJ, Boice JD Jr et al. Bone sarcoma linked to radiotherapy and chemotherapy in children. N Engl J Med 1987; 317: 588-593. Tucker MA, Meadows AT, Boice JD et al. Bone Cancer (BC) linked to radiotherapy and chemotherapy in children. Proc Am Soc Clin Oncol 1985; 4: 239. Tunn PU, Schmidt-Peter P, Pomraenke D, Hohenberger P. Osteosarcoma in children: long-term functional analysis. Clin Orthop 2004; 421: 212-217. Unwin PS, Cannon SR, Grimer RJ et al. Aseptic loosening in cemented custom-made prosthetic replacements for bone tumours of the lower limb. J Bone Jt Surg 1996; 78-B: 5-13. Ward WG, Yang R, Eckardt JJ. Endoprosthetic bone reconstruction following malignant tumor resection in skeletally immature patients. Orthop Clin North Am 1996; 27 (3): 493-502. Weatherby RP, Dahlin DC, Ivins JC. Postradiation sarcoma of bone: review of 78 Mayo Clinic cases. Mayo Clin Proc 1981; 56: 294-306. Weis L. Common malignant bone tumors: osteosarcoma. In Surgery for Bone and Soft Tissue Tumors, Simon MA and Springfield D, Eds. Philadelphia: Lippincott-Raven; 1998, pp 265-274. Wuisman P, Enneking WF. Prognosis for patients who have osteosarcoma with skip metastasis. J Bone Jt Surg 1990; 72: 60-68. Van Trommel MF, Kroon HM, Bloem JL et al. 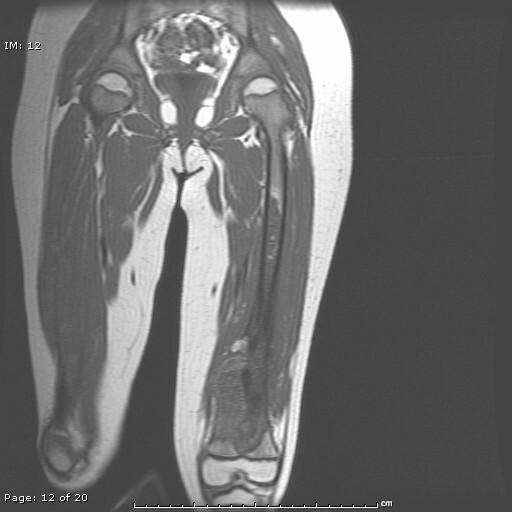 MR imaging based strategies in limb salvage surgery for osteosarcoma of the distal femur. Skeletal Radiol 1997; 26: 636-641. Widhe B, Widhe T. Initial symptoms and clinical features in osteosarcoma and Ewing sarcoma. J Bone Jt Surg 2000; 82-A: 667-674. Winkelmann WW. Rotationplasty. Orthop Clin North Am 1996; 27(3): 503-523. Wold LE, McLeod RA, Sim FH et al. Atlas of Orthopaedic Pathology. Philadelphia: W.B. Saunders Company; 1990. Zhao Y, Qiu GX. Relationship between vascular endothelial growth factor expression and angiogenesis in osteosarcoma. Zhongguo Yi Xue Ke Xue Yuan Xue Bao 2001; 23(6): 619-22. V2N1 ESUN Copyright © 2005 Liddy Shriver Sarcoma Initiative. I am 11 years old. When I first found out that I had osteosarcoma, I was very confused, scared, and upset. I had heard so many scary stories about people with cancer. Now that I have been through chemo, I feel more positive. Some people worry about scars from surgeries, but I consider them badges of honor. Having cancer isn’t as bad as I thought it would be. I want to live. My life now is wonderful; I have opened doors that were closed before. I refuse to dwell on what might have been and instead have focused on what I have to do to adapt to life as an amputee and cancer survivor. My ordeal has taught me to value every day. I believe you should live your life to the fullest – you never know what is around the corner. Read more. 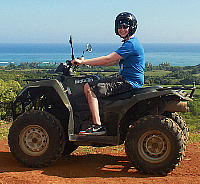 At age 19, just as Logan's life was unfolding he was diagnosed with osteosarcoma in his pelvis. He dropped out of Michigan State University (where he planned to try out for the men's soccer team), moved back home and surrendered his life to the treatment of this disease. Later, after several months of chemo, Logan was faced with the dreadful decision of whether to have the hemipelvic amputation or not. He chose to make a trade: his body for his life. Logan lost his left hip, pelvis, and all of the leg below to osteosarcoma - and he remained hopeful for a long and fruitful life. When he awoke from surgery he gave us all a thumbs up, and 24 hours later was learning how to climb stairs. Read more about Logan. I coped with laughter; I watched comedy, specifically George Lopez. The minute I walked in my hospital room, I had the movies selected. I didn't sleep if the TV was off - I think so that I could not think about what was going on inside of me. I lost all of my middle school friends except for one; to this day I don't have any of them. It was rough, as a young boy, to keep friends. Girls tends to be more emotionally invested in friendships than boys. If a friend was diagnosed, I would say the truth: You are about to endure something difficult, but know that many of us have done it and made it through. Time passes, do what you need, stay strong and see the end of the pain in sight. Read Justin's story. Other than the pain in my leg and physical changes, (scars, stretch marks, weight gain, etc.) I'd say my life is mostly back to "normal," though I don't think you ever really have a normal after something like this happens to you. I wake up feeling like I have way too much to do and not enough energy, but I just make myself get up and go to work, then I start to feel better. I'm extremely proud of the things I have been able to accomplish this past year, and I'm looking forward to being able to do even more! I'm trying not to let cancer define me as a person, but I have to say that it is a big part of who I am now. I am a survivor and I'm proud of it. When people see my leg and ask me what happened, I tell them "I had cancer." They look at me with sadness and tell me they're sorry, and I tell them that I'm a survivor. They say, "You're such a strong person," like they know me. LOL. If only they knew the half of it! " Read Wendy's story. The day our daughter was diagnosed with osteosarcoma was the worst day of our life. The days since have been hard for our family, but they have also been amazing. I have become closer to my child than I realized I could be. I have cried her tears, felt her pain, and prayed for her earthly healing. I love this sweet little girl with all my being; she is my baby. I could not imagine a day without her. That thought has run through my mind so many times since that awful day 9-5-06, the "what if’s" and the "how comes." Too many questions…few answers. I have learned more about chemotherapy, low counts, blood transfusions, platelets, reconstructive surgery, hospital visits, neutropenia, liver functions, you get the idea, more than I would have ever wanted to know in a lifetime. Taylor encompasses my life. I think of her every minute of the day. I hate this cancer; I cry to see her and all these children go through this treatment, to see them so sick, to see these other families watch their precious children have to endure this disease, as we have watched Taylor. I fight for a cure. The friends I gained from this journey are amazing; they understand me. I would not wish my child to have to go through this, but am grateful for the way my life has been touched by the people who have come into it because of her diagnosis. Philippians 4:11 "I have learned to be content whatever the circumstances." I may not like what is happening to my sweet girl, but will fight for her life and be content with mine to have her in it. I am Blessed and grateful for this sweet life God has entrusted to me my sweet girl, Taylor. My scar was 60 staples long running from a few inches below my knee to close to the top of my thigh. I continued on chemo after surgery for five days a month for the next twelve months. It was grueling, awful, and scary as heck, but I knew that I had to accept it into my body in order to survive…and I did…every time. I became more and more positive in my attitude with each chemo session down, as I knew that I had been given another chance to live and to make a much better life for myself. That is what I did when it was all over with and I could refocus on what I had in life, and not what had been taken from me. Read Mel's story. 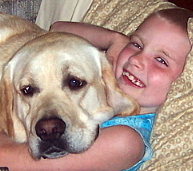 My son was diagnosed with osteosarcoma on September 11, 2008, not the best day in general to be told devastating news. He was 13 years old, just starting out in his life. His tumor was right below the knee in his tibia; we went from having a normal everyday teenager to a child with cancer. When we heard the news from our primary doctor, as he blurted it out to us while standing in his office, my first reaction was, "It has to be wrong, let’s take another." My son’s first reaction was to put his arm around me and say, "It’s going to be okay, Mom." Here we were standing in the doctor’s office right after being given devastating news, and my son was comforting me. Where do they get the strength? It’s only been five months and he has continued to have that strength and courage that he had from day one. On January 22nd 2009, my son had a through-knee amputation. This was his choice. He said from the beginning, "If they have to take my leg to get the cancer, so be it," and that is what happened. He was not willing to give the cancer a chance to spread; he didn’t want to endure any other procedures for surgery, revisions, or leg lengthening. It’s now been a little over a month and he is doing great. He’s thinking about his future, what he wants to do and see. We continue to encourage this attitude and continue to support all his decisions; it is his life, after all. As we go through this roller coaster in Cancer Land, we have been reminded how precious life truly is and are very thankful for all we have. And we continue to look towards the future. I wish I had known when I was diagnosed what my life would look like nine years later. It would have helped me so much to know that the severe pain would get better, that I would have a job again, that I would have a child and be able to hug her tight (even if it is an odd looking hug) and lift her (all 30 pounds of her!). I wish I had known that I would get so hopeful that I would feel that I could have a child and might even live to see her 20th birthday. I wish I had known that everything would be okay. Read Mary's story. In June of 2004, my 6-year-old daughter, Tylar, was diagnosed with osteosarcoma of the right mandible. She started chemotherapy and soon underwent tumor resection in September of 2004, along with reconstruction. Unfortunately, the reconstruction failed, so Tylar is left missing the right lower side of her face. In March, while we were out for a special trip to the mall, there was an animal adoption going on. We were approached by a woman in a wheelchair with a dog with a vest on. She inquired about my little bald girl in a wheelchair. 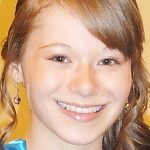 Read more about Tylar. My life is good and, I guess you could say, normal. In November of 2008 I married the love of my life. 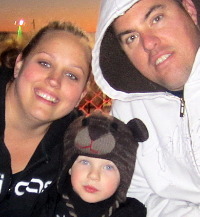 In June 2010 I gave birth to my wonderful son, and my life has taken on a whole new meaning. I love gardening, reading, surfing the web, and spending time with loved ones. I currently do volunteer work for my local mothers' group. Believe it or not, I even performed in a circus, juggling and WALKING a tight rope! Read Deborah's story. In March of 2012, I celebrated five years of cancer freedom from osteosarcoma, and in November of 2012 I will celebrate four years of cancer freedom from AML! Today I am feeling great. I am cancer-free and I am able to spend a lot of time with my three children: Sydney, who is now 15, and my twin sons Tanner and Trevor, who are 8 years old. We spend a lot of time travelling, going to sporting events and visiting family and friends. Read Kelly's story. In October 2008, I married the man of my dreams. I never thought that someone would come into my life and want to deal with all the things that sarcoma brings, but not only did he come into my life and I married him, but we also found out we were expecting a baby. My oncologist was shocked to say the least. Since chemo I never had a menstrual cycle, so we just assumed I was pre-menopausal and that pregnancy would not be in my cards. So not only was my oncologist surprised, but it took seven positive home pregnancy test for me to even begin to think that it was true. Read Cari's story. This group provides a network of friends who are dealing with issues related to osteosarcoma. An ACOR "Mailing List" is a free, non-moderated discussion mechanism for patients, caregivers, researchers, and medical professionals to exchange messages with each other. Messages are "posted" by someone on the list (i.e., a member of the support group) and cover a wide range of topics, e.g., patient experiences, research articles, clinical trials, current treatment practices and alternative treatments. A posting often results in an "online discussion" of the topic. Sometimes, one or more medical professionals are members of a support group and may comment on a posting. We maintain listings of sarcoma treatment centers, local support groups and organizations that provide financial assistance to sarcoma patients and their loved-ones. The Liddy Shriver Sarcoma Initiative is pleased to support osteosarcoma research and has funded and co-funded more than $1.1 million in osteosarcoma research grants. Those who have been impacted by osteosarcoma know that it is a rare and difficult disease. It often strikes children and young adults, and treatment can involve up to a year of aggressive chemotherapy and surgery. It is our hope that research will lead to newer and better treatments for those who are diagnosed with osteosarcoma. $340,400 Grant: In this global collaborative study, Drs. Nielsen, Blay, Demicco, Maki, & Thomas aim to reveal the immune system's role in osteosarcoma and undifferentiated pleomorphic sarcoma and to build a foundation for the use of immunotherapy in sarcoma treatment. This grant was funded by the Liddy Shriver Sarcoma Initiative, the Alan B. Slifka Foundation, and the Wendy Walk in October 2015. $50,000 Grant: In this study, Amity Lynn Manning, PhD aims to reveal vulnerabilities within osteosarcoma cells that can be exploited to render the disease less aggressive and more sensitive to traditional therapies. This grant was funded by the Liddy Shriver Sarcoma Initiative in November 2014. It was made possible by generous gifts made in the memory of Hallie Brown. $62,500 Grant: In this study, investigators at the Hebrew University of Jerusalem will explore pre-treatment biomarkers of osteosarcoma metastasis and their responsiveness to therapy. They hope that the study's results will suggest a new anti-miRNA treatment, therapeutic target and/or biomarker that can be used in the managed of osteosarcoma. This grant was funded by the Liddy Shriver Sarcoma Initiative and the Alan B. Slifka Foundation in March 2014. It was made possible by generous gifts from Sarah’s Garden of Hope, the friends and family of Hallie Brown, Nathan Burgess, Grace Buckel and Natalie Flechsig. $50,000 Grant: In this study, investigators from Case Western Reserve University and the National Institutes of Health will bring a new set of tools and perspectives to the problem of osteosarcoma metastasis, or tumor spread. The team of researchers expects, for the first time, to determine what genes and proteins are truly responsible for osteosarcoma metastasis. This grant was funded by the Liddy Shriver Sarcoma Initiative and the Alan B. Slifka Foundation in June 2013. It was made possible by generous gifts from Sarah’s Garden of Hope, Brandon’s Defense Foundation, Fishin’ For The Cure, Katelyn Andresen and the friends and family of Hallie Brown, Nathan Burgess, Bailey Moody and Alyssa Divers. $50,000 Grant: In this study, investigators from the National Cancer Institute will alter T cells so that they recognize and kill osteosarcoma and rhabdomyosarcoma cells as if they were virus-infected cells. They will then use blocking antibodies to prevent the cancer from dampening the T cells' immune reaction. The investigators hope that the research will improve current immunotherapies and make them more effective in treating sarcomas. This grant was funded by the Liddy Shriver Sarcoma Initiative in December 2012. $50,000 Grant: In this study, investigators from Mt. Sinai School of Medicine will build on their previous work on the MTAP gene in the hopes of identifying a target for the treatment of osteosarcoma and malignant fibrous histiocytoma of the bone. This grant was co-funded by the Liddy Shriver Sarcoma Initiative in October 2012. It was made possible by generous gifts from Laura Somerville, Brandon’s Defense Foundation, Soccer ‘Round the Clock, Sarah’s Garden of Hope, and from the friends and families of Jonah Chrisman and Sara Corbelli. $250,000 Grant: In this study, researchers from three countries will work together to gain a better understanding of bone sarcoma metastasis and how it might be stopped with targeted therapies. Investigators hope that the study will lead to more research and ultimately to new targeted treatments for young sarcoma patients. This grant was funded by the Liddy Shriver Sarcoma Initiative and the Reid R. Sacco Memorial Foundation in October 2012. It was made possible by generous gifts to the Initiative from the Arlo and Susan Ellison Family, the Jack Langseder 4evRSTRONG Foundation, Fishin' for the Cure and Strike Out Sarcoma. $50,000 Grant: In this study, investigators at Texas Children's Hospital, Dan L. Duncan Cancer Center and Baylor College of Medicine found that p27 mislocalization is a frequent event in osteosarcoma cases. The researchers plan to continue their work on p27 with the goal of developing a novel therapeutic strategy to improve the outcome of osteosarcoma patients with metastasis. This grant was awarded by the Liddy Shriver Sarcoma Initiative in February 2010. It was made possible by generous donations from the families and friends of Sammie Hartsfield, Brandon Gordon, Emma Koertzen, Todd Andrews, Logan Brasic, and Shannon Ryan. $50,000 Grant: In this study, researchers at Texas Children's Hospital and Baylor College of Medicine found that the overexpression of CDC5L is likely to contribute to high genomic instability in osteosarcoma. The investigators plan to continue their work by identifying genes regulated by CDC5L and designing and screening inhibitors of CDC5L function that might prove useful for arresting cell proliferation in osteosarcoma. This grant was awarded by the Liddy Shriver Sarcoma Initiative in June 2009. It was made possible by generous donations from the families and friends of Sean Keane, Frank Shafer, Brandon Gordon, Logan Brasic, Matthew Siegle, Emma Koertzen, and Lauren Chelenza. $50,000 Grant: In this study, researchers at St. Vincent’s Hospital in Melbourne, Australia, found that PEDF is capable of inhibiting the growth of osteosarcoma in a clinically relevant murine model. PEDF may be used both as a sole agent and in combination with doxorubicin. The data suggests that the true potential of PEDF is as a targeted therapy for osteosarcoma, with the added benefit of reducing morbidity of conventional therapies. The researchers plan to continue their work on PEDF by investigating its effect on pulmonary metastasis and its usefulness in more advanced stages of disease. This grant was awarded by the Liddy Shriver Sarcoma Initiative in August 2008. It was made possible, in part, by a generous gift from the Una O'Hagan family in loving memory of her son, Sean Keane. $50,000 Grant: In this study, investigators at Tianjin Medical University and M. D. Anderson Cancer Center showed that the WWOX protein is lost in more than half of osteosarcoma tissues and in accordance with the gene deletion. Future investigation into the epigenetic regulation of the WWOX gene will shed more light into the early event leading to the loss of the WWOX tumor suppressor gene and provide new therapeutic opportunities for osteosarcomas. This grant was awarded by the Liddy Shriver Sarcoma Initiative in June 2008. It was made possible, in part, by several generous donations: from Herbert Blodgett in loving memory of his wife, Merril; from Una O'Hagen in memory of her son Sean Keane; and from the Kleftis family in memory of Gregory. $50,000 Grant: In this study, researchers at M. D. Anderson Cancer Center found that CIP4 may become a new target for Osteosarcoma treatment. CIP4 caused the reduction of the primary tumor growth in vitro and in a xenograft subcutaneous animal model. Work should be done in the future to better understand the mechanisms of CIP4 activity in OS tumors and to characterize the effect of CIP4 on the growth of OS metastases. This grant was co-funded by the Foster Foundation and the Liddy Shriver Sarcoma Initiative in February 2008. $25,000 Grant: This tissue study was performed in conjunction with a clinical trial on several types of sarcoma, including Osteosarcoma. $25,000 Grant: In June 2004, Dr. Lisa Wang of Baylor College of Medicine in Houston was the recipient of a $25,000 Elizabeth Shriver Memorial Research Award through the Sarcoma Foundation of America. She had been involved in studying a group of people with a genetic syndrome that results in a certain germ-line mutation in all their normal cells. The gene, called RECQL4, is a DNA helicase (enzyme) that functions to maintain genomic stability. When it is mutated, there is genetic instability and an increased risk of osteosarcoma. In this study, Dr. Wang tested whether or not the same mutations are a common feature of all osteosarcomas in order to identify for targets for future therapy. View the study report. 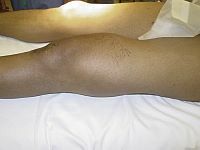 Figure 1: A clinical photograph of a large mass of the distal femur (just above the knee). While this represents the most common location of osteosarcoma, such an obvious mass is not always evident. Figure 2: AP and Lateral X-Rays of the mass seen in Figure 1. Notice the bone formation within this mass. These pictures are virtually diagnostic of Osteosarcoma. Figure 3: T1-weighted coronal MRI image shows a large distal femur mass with marrow extension up the shaft of the femur. Axial imaging shows the adjacent blood vessels and nerves. Being able to see the relationship of these structures to the tumor is very important in planning the appropriate surgery for removal of the tumor. Figure 4: Photograph of osteosarcoma of the distal femur after removal during surgery. The photomicrograph shows abnormal spindle cells producing immature bone (osteoid), the hallmark of osteosarcoma. Figure 6: AP and Lateral X-rays of a metallic prosthesis placed during limb-sparing surgery for an osteosarcoma of the distal femur (just above the knee). Figure 7: Clinical photo of a patient who has had rotationplasty for reconstruction after removal of a tumor. Note that the foot has been turned 180 degrees so that the ankle joint functions as a knee joint. Excellent functional results have been achieved with this technique, though cosmetic concerns often limit its use.